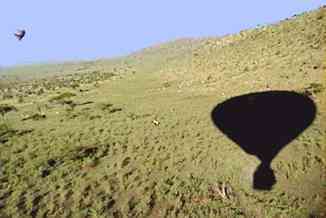 A long blast of hot air cleared our balloon over the Ngama Hills ridgeline. We gazed awestruck onto the northern reaches of the Serengeti. A colorful companion balloon loomed above as we scanned downslope, catching sight of a giraffe craning to reach the leafy canopy of a Candelabra tree. A herd of impalas dashed away on a lower ridge. 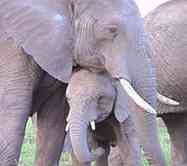 A family of elephants browsed the brush at the base of the hills. 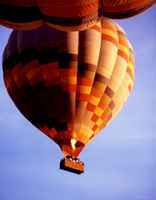 As the shadow of our balloon glided slowly across the slope, then onto a low-hanging cloud, Brad, our balloonist and guide, exclaimed proudly, "Not a bad ride today!" His eight lucky passengers couldnt have agreed more. Wed floated up from the plain that morning as the suns first rays broke over the horizon. In addition to incredible savanna and hill vistas, we were rewarded with game sightings from a new angle. We now better appreciated the vast Serengeti Plain and constant wildlife movement predominated by varieties of antelope such as topi, wildebeest, gazelle, and hartebeest. Floating across the savannah as antelope flees Our binoculars and camera lenses remained vigorously employed during the two-hour flight until we slowly descended to touch down softly in the middle of the Maasai Mara Game Reserve for a champagne brunch -- fresh omelettes, bacon, crepes, and fruit on a table superbly set by the land crew that had followed our flight. After the savory meal, we finished the morning with a Land Rover-based game drive back to camp, going eye-to-eye with a family of elephants, several cape buffalo, and many more Maasai Mara inhabitants. "Not a bad ride today!" my wife Rita exclaimed to me. The hot air balloon safari was but one of many exciting experiences during four intense days at our Maasai Mara encampment. Other highlights included encountering all of Africas "Big Five" (lions, rhinos, elephants, leopards, and buffalo); visiting a Maasai tribe village; and taking a bush flight to view Lake Victorias incredible bird life and visit a Luo tribe fishing village. 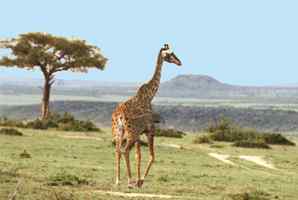 The reserve sits on the extreme northern end of the Serengeti Plain that runs northward from Tanzania into southwestern Kenya. Situated near the equator at approximately 6,000 feet altitude, the climate is surprisingly mild. We visited the reserve in December, just after brief rains had brought the plain back to a beautifully green state following a severe dry spell. The Maasai Mara receives the highest rainfall of the Serengeti ecosystem (40" annually), giving rise to the annual migration of approximately two million wildebeest, zebra, eland and gazelle from Tanzanias drier Serengeti National Park. Although the large migrating herds had recently returned to Tanzania, there still remained a large non-migrating population of these animals. The relatively small reserve (600 sq. miles) is known for its high density of varied species due to the favorable climate and the array of habitats: grassland, bushland, woodland, marshland, rivers and riverine forests, and rocky hillsides. Micato Safaris, one of many experienced local guiding companies, hosted our safari at Siana Springs, appropriately called a "luxury tent camp," near the eastern gate of the reserve. 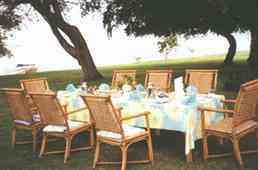 The tents were scattered throughout a beautiful acacia grove on the edge of a spacious central lawn. Each screened tent accommodated two people in comfort. A covered bar and dining room served up hearty fare at the center of the complex. The camps refreshing, secluded swimming pool sat in a nearby grove. Were we really on the Serengeti Plain? Safari vehicle at edge of the bushland Each morning wed rise early to meet our guide for the days first game drive. Six guests were assigned to each open-top vehicle. Our guide, Moses, a member of the Kikuyu tribe, spoke nine languages and knew the reserve like the back of his hand. We had an early morning and late afternoon game drive each day, separated by a long lunch and rest stop back at camp. 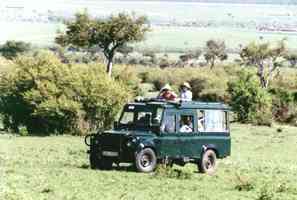 We took six game drives and encountered every African animal that we had dreamed of meeting since we were youngsters. The detailed EcoGuide and animal checklist that the camp provided was soon filled with our checkmarks; we felt almost ready to narrate an episode of Wild Kingdom. However, nothing could have prepared us for the feelings of joy and awe as we viewed, photographed, and filmed these animals up close and personal: a young elephant as it approached its suckling mother; a baby lion greeting its thick-mane father with a swish of its tail, then snuggling with its mother; a horde of storks and vultures ripping longs strands of meat from a fresh carcass; two giraffes strolling gracefully and synchronized across the grassland; a sleeping leopard next to a fresh kill high in an isolated tree; rooting warthogs and a troop of baboons darting in the bush; a herd of buffalo grazing intently, tickbirds pecking at their backs; a watchful, standing pregnant cheetah; a grazing black rhinoceros with huge horns and perked ears. Click here to view additional wildlife gallery photos. One afternoon we paid a visit to a local Maasai settlement. 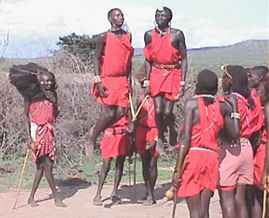 The Maasai live in dung and timber huts located within an acacia-thorn enclosure. Herders by trade, they protect their precious cattle from lions and leopards at night by sheltering them within the settlement The Maasai diet consists primarily of cattle blood and yogurt, with meat reserved for special ceremonies. The red-clothed Maasai males pass through three life stages with special rites of passage  boyhood, warriorhood (around age 14), and elderhood (around age 30, when they own enough cattle to marry several wives). Our visit was highlighted by a short talk by one of the warriors and a demonstration of athletic dancing featuring incredibly high leaps. The women sang tribal songs and tended the multitude of young children near the huts. An "open house" at one of the huts revealed two small, dark rooms filled with beds and a vented fire pit. The tribe then pulled out an array of carved masks and bead necklaces for hawking to our small group of visitors. We gladly purchased a souvenir of the unforgettable visit. The Maasai people stand unique in Kenya as most proudly holding onto their centuries-old culture. 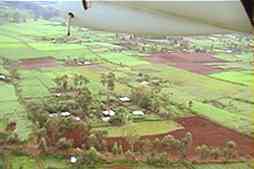 An early morning six-passenger bush flight took us one hundred miles northwest to the shores of Lake Victoria. As we passed over an escarpment from the Serengeti we flew over Kikuyu tribal farmlands and viewed beautifully groomed fields interspersed with homesteads and dirt roads spotted with bicycles and oxcarts. After crossing a low range of ancient volcanic mountains, we came upon Africas largest lake, Victoria, source of the 4,000-mile Nile River, before landing at the private airstrip of the five-star Rusinga Island Resort. After a brief tour of the resort we breakfasted grandly on a table set on the lawn next to the lakeshore, chatting comfortably with Peter, a local fourth-generation colonialist who works as a freelancing safari guide throughout Kenya. 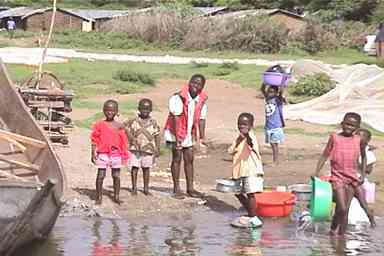 He related how he had established the Siana Springs Camp twenty years earlier. A local Luo tribe member then took us on a boat tour around the island to visit a local Luo fishing village. The village leader met our small group and guided us through the village. Sardines were drying on the ground to be later used as chicken feed. Goats and dogs mingled freely with the young children who clamored to have their photos taken. A small market displayed some grain and smoked fish. The timber and dung walls were topped with roofs of corrugated iron. We couldnt help but note the contrast between this village and the nearby resort. On our return trip we motored slowly around Bird Island, which was raucously teeming with egrets, cormorants, fish eagles, kites, kingfishers, and large monitor lizards. It had been with trepidation of the unknown that we had first planned our trip to Kenya, but after just four intensely filled days, the Maasai Mara region was in our hearts and our minds, figuratively to the depths of our souls. The country, animals, and people of this unique region of our planet would be forever with us. 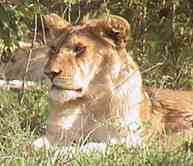 Click here for details to plan your own trip to the Maasai Mara region of Kenya.